NAVSA caucuses are created and maintained by members who wish to develop communities around particular fields or issues. Each caucus holds a meeting at the annual conference, and might organize other events such as panel proposals, listservs, and reading groups. If you are interested in creating a caucus, please contact NAVSA’s VP, Dennis Denisoff (dennis-denisoff@utulsa.edu). If you are interested in joining an existing caucus, please contact the caucus representative listed below. The 19th-Century Theatre Caucus (19CTC) is a research network of scholars working on nineteenth-century theater, drama, spectacle, exhibition, and performance of all kinds. This includes not only Victorian theatrical entertainments and their embodied performance but also connections between theater and other arts, between drama and other literary forms. We cultivate work on theatricality, performativity, adaptation, the melodramatic mode, etc. in a variety of genres, examining all of this in relation to broad questions of culture. We met officially for the first time at the Pasadena NAVSA in 2013 to address the paucity of papers and panels on theater, drama, or performance. At the Hawaii NAVSA in 2015, we expanded our mandate to include sponsoring actual performances (which are a form of research), culminating in the marvelous staged reading with piano accompaniment of John Brougham's 1849 Jane Eyre in Phoenix, 2016. We will continue producing such events at NAVSA and elsewhere. But our primary function remains fostering communication, forming 19th-century theater-related panels, encouraging individual paper submissions, organizing symposia, promoting publication, supporting one another's work, sharing resources, networking, and having fun. We created the caucus to boost the inclusion of theater/drama/performance panels at nineteenth-century conferences and of nineteenth-century panels at theater conferences. Vcologies is an interdisciplinary, international working group of scholars of the nineteenth century committed to the environmental humanities, energy humanities, and other ecology-focused approaches. Our working assumption is that the humanities have crucial contributions to make toward the struggle for environmental justice and for a more environmentally responsible society. How did concepts such as extinction, biodiversity, and ecology emerge from and shape nineteenth-century literature, science, and culture? What do literary and cultural histories of the nineteenth century—the period of both rapid industrialization and imperial expansion—have to contribute to the shaping of environmental narratives today? What are the implications of writing ecological histories in the way that we do? Can we imagine new forms of action consonant with our political moment that build from our study of the nineteenth century? The Teaching University Caucus works as an advocacy group and networking hub for Victorian studies faculty at teaching-intensive institutions. We support each other in maintaining robust research agendas while working under various institutional constraints and larger teaching loads, create opportunities to discuss teaching and pedagogy of Victorian interest, and facilitate intellectual exchange and professionalization for current as well as prospective teaching university faculty. This caucus offers a network for scholars researching the figures, issues and cultures connected with the international Aesthetic and/or Decadent Movements. It is genuinely interdisciplinary, seeking to explore how these twin movements operated across literature and the arts in the nineteenth century. The caucus aims to explore the angles that have driven the resurgence of interest in studies of Aestheticism and Decadence, including economics, politics, gender and sexuality, cosmopolitanism, and recoveries of archival material. At the same time, it will be a welcoming space in which to introduce new perspectives and develop burgeoning approaches to the field. We will have our inaugural meeting at the Banff NAVSA in Fall 2017, hosted by Prof Kristin Mahoney, and thereafter hope to promote the presence of new work on Aestheticism and Decadence at NAVSA by hosting panels alongside an annual lunch meeting. This caucus is run by a small team of scholars on the field and associated with the International Society of Fin-de-Siècle Studies (http://findesiecle.exeter.ac.uk/). You can join its Listserve for news on this caucus, information on events and publications in the field, and regular guest blogs by emailing Kate Hext at 1880to1920@gmail.com. This caucus offers a scholarly network for those whose research and teaching interests include the central role of poetry and poetics in the literary and cultural history of the long nineteenth-century. We claim “Victorian” under the auspices of our affiliation to NAVSA, but welcome those working in Romanticism and in emerging Modernist contexts, as well. We also claim the vital importance of investigating the complex cultural work of poetry in its diverse genres, hybrid forms, and innovations in a period when it pervaded every sphere of life. Poetry informed both everyday Victorian practices (expressions of sociability, sexual identity, faith, and grief, for example), and transformative literary, artistic, political, religious, social, and scientific developments of the nineteenth century (the Pre-Raphaelite, Tractarian, and Chartist movements, for instance, or debates over evolution, empire, and mass culture). The VPC seeks to foster intellectual exchange among the multiple methodologies and perspectives that scholars now bring to reading and interpreting nineteenth-century poetry, such as the new formalism; distant reading and digital technologies; theories of gender and sexuality, race, transnationalism, and globalization; exploration of contexts in science, religion, politics, and periodical culture; and investigation of the relations between Victorian poetry, other literary genres, and the sister arts (music, the visual arts, theatre, contemporary Neo-Victorianism in film and new media). As with other NAVSA caucuses, the Victorian poetry caucus aims to provide a space for communication and collaboration, sharing resources, supporting new scholars, and organizing conference panels or publishing initiatives that engender fresh approaches or engage with particular challenges within the field. The caucus also organizes social gatherings providing more informal networking opportunities in a convivial environment. The VPC began to take shape with an impromptu lunch organized by Amy Kahrmann Huseby at the 2016 NAVSA in Phoenix, followed by a dinner organized by Amy and Marjorie Stone for the 2017 NAVSA in Banff, and discussion in a session at the Banff conference on strategies for raising the profile of poetry and poetics in Victorian Studies conferences and other contexts. We will have our inaugural meeting in St. Petersburg, Florida in Fall 2018, hosted by Melissa Valiska Gregory, Linda Hughes, Amy Kahrmann Huseby, Jason Rudy, and Marjorie Stone. Check out our social networking sites on Twitter (@VicPoetryCaucus) and Facebook Group (Victorian Poetry Caucus), as well as our website (https://victorianpoetrycau.wixsite.com/poetrycaucus) for updates on forthcoming publications, conference panels, edited collections, and related research news. Those interested in joining VPC’s listserv for news on this caucus, information on events, publications in the field, and regular guest blogs should email our Caucus Representative Amy Kahrmann Huseby at VictorianPoetryCaucus@gmail.com. The Victorian Art History Caucus offers a network for scholars researching all aspects of art history, e.g., the art market, the social history of art, illustration, and visual culture in general. It is interdisciplinary, seeking to explore how the visual operated across disciplines, such as literature, anthropology, history, media. As a caucus, we also intend to advocate for the significance of art history within the long nineteenth century and its critical role within the study of visual cultures. The caucus aims to explore all topics related to the study of Victorian visual culture, including economics, politics, gender/ sexuality, cosmopolitanism, and archival material. We welcome scholars in other disciplines and we welcome new perspectives and approaches to the field. Our inaugural meeting will take place at the NAVSA 2018 conference. Further information can be provided by joining the Google group via email: navsa-art-history-caucus@googlegroups.com. The Data Caucus assembles scholars and teachers working with data, which we define as information that has been selected, categorized, and otherwise made tractable for quantitative and/or qualitative analysis. 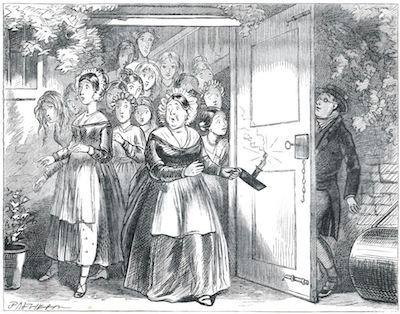 Our conception of data encompasses Victorian practices for gathering and expressing information; cultural attitudes toward data; digital collections; digital pedagogies; quantitative methods; and digital humanities. We hope to show how integral data is to our pursuits as scholars of Victorian literature, history, and culture. To this end, we create this caucus to collaborate, integrate our methodologies in established and emerging areas of study, share resources and best practices, and draw inspiration from one another’s work. We also ask questions about the relationship between literature, history, culture, and data. This might include thinking about literature as data; history as data storage; culture as data practice; and scholarship as data preservation. In addition, we welcome modifications to these contemporary uses of data by the Victorians’ understanding of and use of information. After an informal meeting at Banff 2017, we will have our first official meeting in St. Petersburg, FL, at NAVSA 2018. For more information on or to join this caucus, email Megan Ward at megan.ward@oregonstate.edu. The Gender Caucus is a network of Victorian studies scholars with a vital interest in the study of gender. Victorian studies was among the first fields to promote gender scholarship, and we would like to continue this legacy by encouraging new conversations on the intersection of gender with sexuality, race, class, and disability. We are committed not only to research and teaching, but also to activism and mentorship. We hope to promote greater equity with respect to gender and sexuality, including the development of strategies to prevent discrimination and harassment in the profession at large. We also want to offer an especially warm environment for graduate students and junior scholars, offering mentorship that focuses both on the field of gender studies and to impact of gender on life in academia. The Gender Caucus met for the first time at NAVSA 2016 in Phoenix and organized formally in Banff in 2017. We hope to host panels, roundtables, lunch meetings, and other networking opportunities at future conferences.